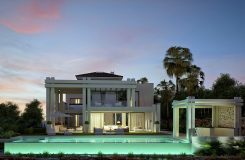 A magnificent plot with a luxury villa project in Sotogrande Alto, near the Almenara and Valderrama golf course. Located in calle Grazalema, it overlooks the golf course and the mountains. Plot with an area of 2,872 m2. 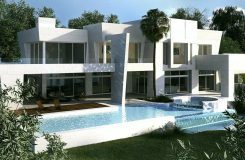 For the construction of a modern luxury villa, with a construction area of 661 m2, plus the basement of 582 m2. With an exclusive design, spacious living areas and bedrooms. Large terraces and an infinity pool overlooking the golf course. Very private area in a gated community. The house can be ready in 12 months.